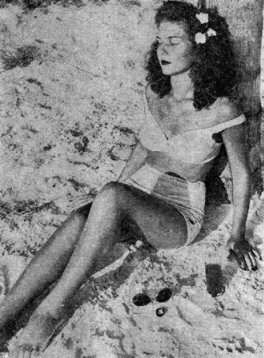 SUNNING IN FLORIDA Seems all the pin-ups are in Florida these days. Here Martha Gray soaks up the sun at Lakeland. Roundup Staff Article CALCUTTA - Three G.I. 's and one officer were injured and three U.S. Army vehicles were burned in Calcutta this week as civilian disturbances, protesting the conviction and sentence of Capt. Abdul Rashid in the Delhi I.N.A. trials, mounted. British military authorities took over direction of all vital functions of the city Tuesday. U.S. commanders were evacuating all American personnel in Calcutta to their own organizations outside, except for those billeted in Camp Maidan inside the city. All men were restricted to camp areas. All American vehicles were ordered off the streets by 7 p.m. Tuesday until further notice, and the trips authorized after that were under direct supervision of the Base Section Provost Marshal. Mail and courier service between Calcutta and other parts of India was disrupted. Trouble originally started Monday afternoon when police ordered a procession to disperse, but this was soon quieted down. In the evening disturbances commenced in north Calcutta where some 13 military vehicles were burned, including three American vehicles, and others were damaged. One U.S. officer was hospitalized with a broken arm, and two EM's received severe lacerations. Approximately 1,100 American troops on pass were stranded in the city and were billeted in town for the night because they could not pass through the road blocks established in North Calcutta. One U.S. MP jeep was stranded in the vicinity of Sealdah Station and the occupants used tear gas and fired a few rounds in the air in order to move out of the area. There was no indication of injury to rioters from this incident. A convoy of trucks was made up for the stranded men on pass Tuesday morning and the proceeded to Kanchrapara and other nearby billets. But new road blocks appeared in North Calcutta, on Upper Circular Road, on Russa Road, and near the Grand Hotel. One American MP was injured Tuesday morn ing and was sent to a hospital. MAIL TIED-UP Six thousand pounds of mail for I-B troops have backlogged in Casablanca, due to lack of available transportation, the Theater Postal Officer disclosed this week. He explained that only a single ATC ship has delivered mail from Casablanca to this theater in the last two weeks. There is no longer any backlog of I-B mail en route to the U.S.
Roundup Staff Article A new letter has been issued by Theater Headquarters which governs the embarkation of personnel in the Replacement Depot at Kanchrapara for the U.S. This new directive guarantees that returnees in higher categories will receive priority consideration over those in lower ones. Within separate categories of surplus personnel, a "first in, first out" policy will be carried out. (2) Medical officers, emergency returnees, and personnel removed from the ATC air backlog. (3) Personnel requested by the War Department for permanent change of station to the U.S.
(4) Enlistees or re-enlistees in the Regular Army. b. Male personnel eligible for separation as of Jan. 1, 1946.
c. Male personnel eligible for separation as of April 30 (Officers, 67 points or 45 months' service; EM, 45 points or 30 months' service) in accordance with their arrival dates at the depot. d. Male personnel eligible for separation as of June 30 (Officers, 65 points or 42 months' service; EM, 40 points or 24 months' service) in accordance with their arrival dates at the depot. e. Male personnel authorized for return to the U.S. for reasons other than listed above in accordance with their arrival dates at the depot. These personnel will include those for whom there is no military necessity regardless of points or service, under the overall War Department policy. In making up passenger lists, all personnel who are in the depot seven days prior to the date a vessel is scheduled to sail will be considered. To insure that no 5th priority personnel will be kept at Kanchrapara indefinitely, all such personnel remaining at the depot as of 2400 hours on Feb. 20 will be embarked prior to 5th priority personnel who arrive on or after Feb. 21, regardless of point score or length of service. The same regulations will be in effect for personnel remaining at the depot as of Mar, 20, April 20, etc. This procedure has been adopted because the War Department has directed that all personnel for whom there is no military requirements in overseas theaters will be returned as soon as possible, despite the fact that they are not eligible for separation. Also, in order to relieve congestion at Kanchrapara and to retain the services of officers and enlisted men stationed in the Calcutta area, arrangements have been made whereby those concerned will remain on their respective duties until necessary to report for embarkation. The effective date for inclusion on passenger lists will be the date of the order sending them to Kanchrapara. Meanwhile, a new Theater Circular No. 35, dated Feb. 7, lists personnel to be released from their organization on or before April 15 for return to the U.S. and separation from the service. These are as follows: (1) Male EM with 45 points or more or with 30 months' service as of April 30. (2) WAC EW with 24 months' service as of April 30. (3) Male officers with 67 points or more or 45 months' service as of April 30. (4) WAC officers with 36 months' service as of April 30. Individuals with an MOS which is listed as "scarce" on Theater Circulars Nos. 117 and 139, 1945 series, may be retained in the Theater for not more than six months from the date on which they are eligible for separation. Enlisted personnel who have volunteered to remain on duty in the Theater for a certain period of time can be released by their immediate commanders at the end of the agreed period. Officers who have signed a Category I, II or III volunteer statement will not be considered eligible to return to the U.S. until released by higher headquarters. Regulations governing the return of Medical Department officers are listed separately. Procedures have been set up under the new circular to govern the release and return to the U.S. of all surplus officer and enlisted personnel not eligible for separation from the service. Personnel other than ICD-ATC personnel, who become surplus to the need of a major command, will be reported to the other major commanders for an assignment request or a statement that the personnel are not required. Men not required by other major commands of the Theater will be moved to Kanchrapara, except for personnel not entitled to discharge by June 30 (Officers with 65 points or 42 months' service and EM with 40 points or 24 months' service). These personnel will also be reported to the China Theater, and if not required there, necessary instructions will be issued by I-B Theater Headquarters for their disposition. Movements of personnel will be carried out in accordance with Theater Headquarters quotas and schedules. Commanders of units throughout the Theater have been directed to make every effort to select personnel with the highest scores and longest service throughout. Of the six troopships scheduled to leave Calcutta for Seattle during February, the General Hase and General Ballou left Monday, the Marine Angel was to sail yesterday, two more will leave later in the month, and one has been delayed until Mar. 1. Two more ships are on the March list. The present schedule is as follows: General Bliss leaving Feb. 17; General Collins, Feb. 20; General Hodges, Mar. 1; Marine Jumper, Mar. 16; Marine Cardinal, Mar. 24. The Hase, Ballou, Bliss, Collins, Hodges, Jumper and Cardinal carry approximately 3,200 passengers each, while the Angel has a capacity of about 2,500 men. Quotas for the major commands in the Theater for movement of personnel during the period of Feb. 11 to Feb. 20 inclusive to Replacement Depot No. 3, Kanchrapara, for shipment to the U.S. are shown at right. Quotas for the periods after Feb. 20 will be published by the Theater in time to fill the next ship, the spokesman declared. The plan now is to delay the movement of returnees from other parts of the Theater to Kanchrapara, rather than bring the men there and have them wait around longer than necessary. KANCHRAPARA - Blood is thicker than water transport. Thomas Templeton, 19, is a seaman 1/c aboard the General Hase. His brother, Sgt. Pleasant C. Templeton, 21, was formerly with the 44th Air Service Group, Dinjan, and was scheduled to head stateside this week aboard the Marine Angel. Through the aid of chaplains, the Red Cross, and friends, the pair were reunited in Calcutta last week after three years of wartime separation. They compared notes on departure time - then both descended on Captain R. R. King 3rd, of Greensboro, N.C., assistant adjutant at Replacement Depot No. 3 and appealed for Pleasant's transfer to the General Hase. Lt. Col. Carl Deuter, depot executive officer, did the honors, and the brothers sailed together this week aboard the General Hase. And just to keep the reunion in fitting tempo, Pleasant, the soldier, will serve as a ship's carpenter and will get crew accommodations. Seaman Thomas will continue his normal sea duties as shipfitter. The brothers worked as carpenters together in civilian life. NEW DELHI - Maj. Gen. Thomas A. Terry, I-B Theater commander, was released from the 100th Station Hospital here on Tuesday, Feb. 12, after a motor accident on Feb. 6 in which he suffered a mild concussion, moderate laceration of the scalp and minor bruises. There was no evidence of a skull or brain injury. Col. Harry N. Rising, I-B Theater Ordnance officer, who was driving the vehicle in which Terry was riding, suffered minor abrasions. Reports of G.I. 's wearing battle stars on their Victory Ribbons, sporting the China War Memorial Badge, and slapping on decorations any way that strikes their fancy has reached the recesses of the inner sanctoriums in Delhi where such things are anathema. It's the job of the Adjutant General's Office to see to it that all personnel get their rightful awards, citations, decorations and ribbons. And it's some job. With men's thoughts turning homeward, they want to get their uniforms really sharpened up with plenty of "salad dressing" - and there are many details which are not too well known connected with that process. A new Theater Circular No. 28, dated 31 Jan. 1946, is being given general distribution, giving a complete recapitulation of all matters concerned with awards and decorations in the I-B Theater. "There are a few popular misconceptions about awards that should be straightened out," an Adjutant General's Office spokesman told Roundup. "The China War Memorial Badge and Ribbon awarded by the Chinese Government is not authorized to be worn by any U.S. personnel. The Burma Star, a British award, is not authorized either. "It has been rumored that a so-called India Defense Ribbon is coming out for U.S. personnel. That is not true, since even British Army personnel know nothing about such an award." It is pointed out, however, that there are individual decorations which have been given Americans in the I-B which can be worn. These include China's Cloud Banner Award (similar to our Air Medal, with different degrees) and the Yun Huey Medal (similar to our Soldiers Medal). Then there are the Order of the British Empire and the British Empire Medal. The U.S. Army is always asked for concurrence in such awards. The average soldier, serving honorably, will have the Good Conduct Medal, the American Theater Ribbon (if he had served in the U.S. for at least a full year before coming overseas) the Pacific-Asiatic Theater Ribbon and the Victory Ribbon. If he wears the four on one line over his left breast pocket, they are worn in that order starting from the wearer's right. But if he wears only three on a line, he would pin the Good Conduct Ribbon in the center over the other three. And if he has the luck of amassing other awards, remember that the highest award should be worn to the wearer's right on the top row of ribbons. 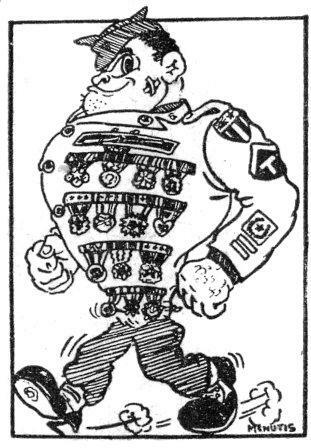 Any other U.S. or Allied awards, if authorized, can be worn in their proper places and should be entered on the service record. members of a unit that is awarded the Meritorious Service Unit Plaque should wear the individual wreath on the right arm only as long as they are with the unit. If it is awarded the second time, a star is authorized inside the wreath on the plaque itself but not on the sleeve insignia of the individual. A new individual award, the Army Commendation Ribbon, is now authorized - to be awarded to an officer or enlisted man commended by a major general or higher ranking officer. This myrtle green ribbon with white bands is designed for service troops. Three bronze service stars for battle participation have been authorized in the I-B Theater. They are the Burma Campaign, India-Burma and the Central Burma stars. Since the CBI was broken up in October, 1944, the China Theater only has been awarding the two bronze service stars for China combat - the China Defensive Campaign and the China Offensive Campaign stars. I-B Theater Headquarters awards the three stars for this theater and China Theater takes final action on the two China stars. SHANGHAI - (UP) - Lt. gen. Albert C. Wedemeyer disclosed this week that no liaison has been established as yet between Russian troops occupying most of Manchuria and American forces, charged with the responsibility for repatriating Japanese in the area. He explained that under War Department orders and directives, U.S. troops in China could not complete their mission until the Japanese in Manchuria have been sent back to their homeland. Wedemeyer said that efforts are being made to obtain information on the numbers and status of Japs in Manchuria and on food, transportation and other items. At Nanking, Gen. Ho Ying Chin, chief of staff of the Chinese Army, told a press conference that all Japs in China will have been removed by the end of June and that the mission of U.S. Marine forces in North China then will be completed. In Chungking, Vice Adm. Charles M. Cook, Jr., U.S. 7th Fleet commander, and Vice Adm. Stuart Murray, now engaged in establishing a U.S. Naval Mission in China, conferred with Gen. George C. Marshall amid unconfirmed reports that the Army plans to pull out of China as soon as the Japs are repatriated and leave American interests completely in the hands of the Navy. A new schedule of regular ATC passenger and mail operations in the I-B Theater went into effect this week, it has been disclosed by Theater Headquarters. Flight No. 1 will leave Karachi daily at 0730, arriving in Calcutta at 1945. Flight No. 33 leaves Karachi daily at 0845, arriving in New Delhi at 1230. This flight leaves Delhi at 1330 for Calcutta, landing there at 1830. Both flights use C-54's. Flight No. 11 leaves Delhi daily at 1400, arriving in Agra at 1500. The return flight, No. 12, leaves Agra at 1600 and lands in Delhi at 1700. A C-47 is used. Flight No. 4 departs from Calcutta daily at 0730 and lands in Delhi at 1100. The C-54 used on this flight leaves Delhi at 1200 and lands in Karachi at 1545. Flight No. 2, a C-54, departs from Calcutta at 1115 arriving in Karachi at 1815 daily. Flight No. 9 leaves Calcutta at 0900 for Chabua where it lands at 1200, and the return trip, Flight No. 10, leaves the Assam strip at 1300, arriving in Calcutta at 1600. This flight utilizes a C-54. Flight No. 201 leaves Calcutta at 0130 on Tuesday, Thursday and Saturday, arriving in Bangkok at 0730. The return trip, Flight No. 202, leaves Bangkok on Wednesday, Friday and Sunday at 1630, arriving in Calcutta at 2130. This is a C-54 operation. Flight No. 5 leaves Columbo each Friday at 1030, arriving in Calcutta at 1930. Flight No. 6 departs from Calcutta each Wednesday at 0730, reaching Columbo at 1330. A C-54 flies this route. Flight No. 31 departs from Bangkok on Tuesday and Saturday for Singapore, where it arrives at 1645. Flight No. 32 returns from Singapore at 0800 on Wednesday and Sunday, reaching Bangkok at 1445. A C-47 makes this trip. The announcement also said that ATC flights from Bangkok to Rangoon and Saigon, and from Singapore to Batavia, are made on a "special mission" basis only. Maj. Gen. Charles R. G. Lane, commander of Rear Headquarters SEAC, last week was awarded the Legion of Merit, degree of Commander, by Maj. Gen. Thomas A. Terry, I-B commandant, in a simple ceremony at Theater headquarters. The award, one of the highest made by the U.S. to members of Allied armies, was given to Gen. Lane in the name of the President of the United States. The citation accompanying it told of his "exceptional ability, great loyalty and devotion to duty" in the preparation and use of Persia, Iraq and India as operational bases for Allied forces. Gen. Lane assisted in the formation of the Persian Gulf Command and in November, 1943, became deputy principal administrative officer to Lt. Gen. R. A. Wheeler, former I-B commandant and Lord Louis Mountbatten's deputy commander in the Southeast Asia Command. The guidebook says Westerners will always remember Rangoon by the landmark of the golden, glittering Shwe Dagon Pagoda. But for the aircrews of the 20th Bomber Command Air Force who "visited" Burma as prisoners of the Japanese, the memories and the landmarks will be different. For them there will be landmarks of horror: the New Law Courts Jail - 7 Americans died there; the Rangoon Central Jail where 27 Air Force men died. They'll always remember "traveling" in Burma - the Death March of all able-bodied prisoners from Rangoon to Pegu, when the British 14th Army threatened Rangoon. They had no food or water for two days. Ten men were bayoneted to death because the could walk no longer. HERE IS THE STORY When the sound of fighting is long stilled, will G.I. 's remember for what purpose they came to South East Asia? When they are back home in familiar places, far away from strange-sounding names like Myitkyina, Batavia, Pakaubaro or Rangoon, will they remember the face of imperial conquest? The full features of the enemy are now being revealed in the War Crimes Trials taking place throughout the world. As a prelude to the opening of the War Crimes Trials in South East Asia, Roundup presents a series of articles detailing the methods of the fascist enemy in this area of the war, based on the hitherto "Secret" files of the India-Burma Theater War Crimes Section: giving facts and incidents never before revealed in any U.S. publication - Editor. For the first time now, full details of life inside the Japanese jails of Rangoon can be told. Here's the story of Major Watson's B-24 crew, shot down in Central Burma early in the war. After lying in the sun three days, and traveling three more days in the sun-baked back of an open truck without medical attention, the severely burned crew members were thrown into solitary confinement in Rangoon Central Jail for questioning on November 22. One man died in solitary. Six were left. "Three of the remaining six men were assigned to my compound," says the Air Force lieutenant who gives the affidavit. "A sergeant had his nose burned off, and his eyes were eaten out by maggots after they had been burned. He was covered with filth and flies by the millions. The Japs made no attempt to cure him." He died in the compound and then there were five. Another sergeant had a slight hip injury. But the Japs did nothing for it. An abscess and blood poisoning developed. He died two weeks after arriving at Rangoon Central Jail. And then there were four. A lieutenant died from his burns. Three left. An enlisted man died during his very first night in the compound. And then there were two - Major Watson and one sergeant, the only survivors of the B-24. Five men dead who could have been alive today with even a minimum of medical care. Let's look into the "normal" every-day aspects of life in Rangoon jails. First stop - Central Law Courts Jail for "staging" to a permanent camp. Here is a summary of what Lt. Peters, AAF, says. "The cells were 9 feet by 12 feet. There were no windows, only teakwood bars facing the corridor. I had received a shrapnel wound in my right arm and shoulder. They put a splint on but never set my arm. I was never allowed to wash the blood off my hands and body. I knew of a lieutenant there who had been tied with poles between his elbows for seven days." Sgt. Brown describes the Central Law Courts Jail. There were no beds. For two months, 8 men were crowded into one cell. They had to rotate sleeping hours on the floor at night. For their first three months, they were not permitted to shave or bathe, or be in the sun. Finally, they were permitted 15 minutes each week in which to shower and sun-bathe, while handcuffed. Prisoners were not allowed to read, sing, talk or communicate with each other in any way. For violating this rule men had to stand at attention for six hours. Of 47 original prisoners here, 28 died. The prisoners generally believed that one of the Japanese guards made a hobby of cutting the genital organs off the bodies of the dead. Next stop - Judson College, used later in the war to replace New Law Courts Jail as a "staging area." Says Lt. Weber, AAF, in summary, "At Judson College, five of us were made to stand up for 30 hours without food or water because we refused to answer certain questions . . . beatings were an almost daily occurrence. A hundred percent of the prisoners were struck by the Japanese at one time or another. I believe there was only one guard I knew in the jail that did not at one time or another strike the prisoners." Last and worse, Rangoon Central Jail, main POW camp, where POW's were first put in solitary confinement for interrogation by the Kempai Tai. Prisoners were regularly beaten for refusal to answer questions concerning American military secrets, or because they refused to sign statements promising they would not try to escape; gross violations of the Rules of Land Warfare. The Jap interrogators told one lieutenant, "The Japanese are the captors, you are the prisoners. We are not bound by the provisions of the Geneva Convention." After varying periods in solitary, prisoners were taken to the regular jail compound. Here food was so short that POW's snared pigeons in the rafters and ate them raw. T/Sgt. White was thrown into Rangoon Jail will a bullet hole through his ankle and a bad flak scratch on his face. No medical aid was ever given him. Most prisoners didn't ask for Japanese doctors. A Captain's affidavit tells why. "The prisoners had observed that any flying personnel who asked for medical attention was given a shot, and within two hours thereafter, the patient was dead. I personally observed the Japanese doctor give one such man a shot, and this man was dead within two hours after the shot was administered." The Japanese chief jailer used to come into the cell wearing a mask to avoid the stench of rotting flesh. He'd laugh at the wounded men, said he couldn't help the lack of care. Orders from Tokyo. In the rules of war, Air Corps prisoners were to be treated differently from others. Shown above in this Signal Corps photo are troops of the I-B and China Theaters as they boarded a troopship at Karachi enroute to the United States. CHABUA - After processing some 50,000 G.I. 's homeward bound from Advance and Intermediate Sections and several western China bases, Replacement Depot No. 5 just "ain't what she used to be." In fact, it's no longer "Repple Depple No. 5," but now the Movement Control of Assam Area Command located in Balijan near Chabua. Even the old system of moving the men home has changed. Instead of spending several days being processed in the depot, men from the forward areas now stay only a few hours at the most. Troops from the Chabua area stay overnight for their processing in a single row of Bombay tents. An I.G. 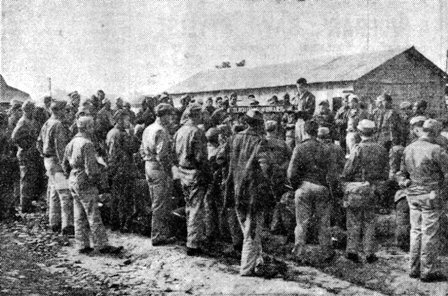 team in Ledo handles the processing of troops from Burma and the Ledo area, checking records, weighing the men and their baggage. From Ledo, the G.I. 's come to the Movement Control in 6x6 truck convoys in the early morning. By early afternoon, approximately 120 men from Ledo and an equal number from Assam Area Command are winging their way to Barrackpore on ATC C-54's. The final ceremony at the depot is quick. Plane manifests with men from Ledo and Chabua are drawn up and the men briefed in groups of 30, the number on each flight. Their records are given a final check and the briefing period orientates the men about their approaching flight. Then they are loaded on two trucks, and driven to the Chabua air strip. There the Red Cross has coffee and sandwiches along with canned music to ease their stay while waiting to board the C-54's. Indian soldiers load their duffle bags on the plane while the men carry their musette bags with them on the plane. The planes have bucket seats, but the flight is only three hours. Eight C-54's plus the daily shuttle plane from Calcutta transport the men to Barrackpore. At Barrackpore, trucks pick up the men and take them to Kanchrapara. When Replacement Depot No. 5 was activated April 12, 1945, troops were sent to Karachi by rail and air as well as Kanchrapara. Besides regular air flights to Karachi, POE, a special troop shuttle train was set up between Chabua and Karachi. C-54's then carried 40 men with 65 pounds each of baggage. Now, 30 men are flown with a baggage allowance of 30 pounds. Thus far, only one plane has been lost since the depot was activated. That occurred last October when a Karachi-bound C-54 went off its course and crashed in the Himalayas with no survivors. After V-E Day, high-point G.I. 's began to flood the depot. From 3,000 in April, the average rose to about 5,000 monthly, making an approximate total of 50,000 men being processed through the depot this far. Since the first week in December, all flights have been to Calcutta, with a few high-priority exceptions of men who will fly all the way home, thus necessitating their being sent to Karachi. The 144th Replacement Battalion and 713th Replacement Company, totaling 140 enlisted men and 13 officers, formed the first permanent party. Now that the bulk of men from Advance and Intermediate Sections are homeward bound, only 15 enlisted men and four officers are handling the processing, with even further cuts in permanent party personnel contemplated when they become eligible for discharge. The Movement Control depot will probably run until April 30, if not longer, according to Maj. Russell W. Rice, depot commander. But there is no method of predicting accurately just how long it will function. The Balijan area's principal unit now is the 1304th Engineers and will be the last to leave this area, as will the 330th Engineers who now maintain the Ledo Area Command. MALIR - When Replacement Depot Number One closed out here on Jan. 28, over 100,000 officers and G.I. 's had cleared these stark environs, scuffed the grey dust off their shoes and took one last, if not lingering, look and said goodbye to India. Harking back to the Fall of 1943, Col. Franklin J. Pruyn, then a Major, recalled how a mere trickle of men entered India and how, two years later, the trickle became a torrent of eager, khaki-clad humanity pointed home. On Sept. 2, 1943, CBI Air Forces Training Command activated the Army Air Forces Replacement Center, precursor of the present repple depple. With 13 officers and 27 enlisted men, the center began to handle arrivals to the land of mystery and enchantment. Three thousand of them came by water and 1500 by air those first months, with Karachi the only port of entry - until December when a detachment was dispatched to Bombay. In July, 1944, the replacement center was redesignated as the 26th Replacement Depot. The following month saw two administrative transitions - the 26th became headquarters detachment of the 126th Replacement Battalion, with two companies in Bombay. 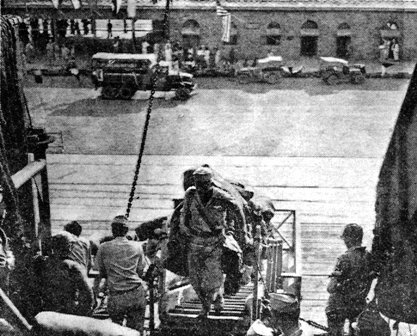 On the 30th of August, the first contingent of WAC's to hit this section of the CBI arrived to be processed by the 126th. The following day, the 126th acquired the designation of Replacement Depot No. One, which it held until the end. In the beginning, the situation was grim. Added to the highly uninteresting and drab impression that newcomers to glamorized India got on arrival in Malir, there was a high diarrhea rate. 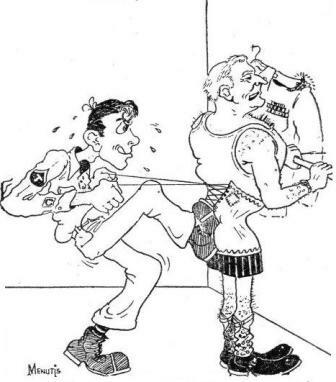 The high incidence of the "GI's" among the men contributed no little to the hiking of the large percentage of rookies who developed psychoneuroses. One of the biggest problems that the command here has had to contend with all along was morale. Efforts to solve it started in the spring of '44 when the Inspector General came through and called the dayroom the best he'd seen in the theater. A paper called Depot Dust was started. A swimming pool was built. Men who were on their way to combat areas filled the chapel where a beautiful altar of carved teak wood had its baptism on Christmas Eve of that year. The men who arrived at Malir in March of '45 won't forget the place in a hurry. Malir had been removed of a good deal of unsightly patches of vegetation - brambles and bushes - by well-meaning C.O.'s. That proved to be a mistake. Sandstorms that month swept down on the camp, and having no breakers to block them, the dust swirled with complete abandon all over the place, getting into the food, and the eyes, ears and noses of all humans who ventured outside the barracks - and even if they stayed inside. Some of the men will long be tasting the dust of Malir that they swallowed that breezy month. In May, V-E Day arrived and the depot prepared for a big westbound trek of high-pointers. The first man in the ASR parade was a Pfc. - Armand Sopinelli, of Erie, Pa. As he stepped off the plane, the man who had enlisted in 1939 and had fought with Merrill's Marauders, got a thrill - as soon as he recovered from the stunning effect of having photographers' flash bulbs going off in his face. Col. Pruyn shook his hand, and several of the ranking officers of the camp beamed. Week after V-J Day, 10 more areas were opened to expedite evacuation of troops, handling both air and water passengers. Obtaining and keeping personnel to man the areas was always a big headache for Col. Pruyn. When the expansion started in August of last year, he interviewed personally screenouts who were mature, capable and felt a responsibility for getting men home as quickly as possible. He took no men under thirty and required only married G.I. 's for his classification section. In the first two months after V-J Day, he lost about 40 percent of his permanent party. Col. Pruyn has a soft spot in his heart for the casuals, if for no other reason that they have proved a life-saver for him in helping to solve the personnel problem. At the cessation of hostilities the depot was suddenly called on to return by boat and plane about 15,000 officers and joes in September with increases scheduled for succeeding months. To take care of this the permanent personnel was increased by about 65 percent, a large part of them johnny-come-latelies. The personnel section jumped from two officers and 15 EM to five officers and 40 EM, who could handle 2000 casuals in 24 hours. Machine-gunners and combat infantrymen, who had come to fight the Japs, were reconverted into clerks, typists, and administrative NCO's. They learned their new jobs without too much trouble, Col. Pruyn said. Their morale was poor at first, but as soon as they realized they would be released as quickly as anybody else with the requisite number of points they settled down and did a good job. With the evacuation of the 17 areas operated by American personnel, the British once again became lords of the 10 square miles of Malir Cantonment, The 2nd Indian Airborne Division had already started to reoccupy Malir in December. During the expansion of Malir, and even before, the four other organizations in the area worked together in close harmony, except for minor differences over observances of regulations. For instance, the ATC commander demanded that his men wear ties continually on and off base. Men of the other outfits - the 380th Air Service Command, Karachi POE, and 181st General Hospital - didn't have to wear ties in the hot weather. Col. Pruyn said the five units operated like a "soviet" with coordination on all matters of policy. "It worked," Pruyn added. IN NEW DELHI SPEEDS PROPERTY DISPOSAL Old-time members of Transport Squadron No. 13 gather for a staff conference in their shore quarters. From left to right: Yeoman 3rd cl. Jimmy Lee; Lt. (j.g.) R. V. Kachinsky, former assistant Beachmaster; Commodore Milton O. Carlson; and Lt. C. M. Peters, the Commodore's Flag Lieutenant and former Beachmaster. (Photo by Sgt. James Minnick, official Signal Corps photographer). A land-locked United States Navy lies in Delhi Town and the nearest body of water is the barracks' bathtub. The flagship is a blue staff car and the Skipper's cabin just another office in the U.S. Army headquarters building, but Commodore Milton O. Carlson, USN, commands from there and land-locked or no, he's the only senior U.S. naval officer in the India, Burma and Malay States area. The Commodore and his staff arrived in the I-B Theater early last December to help the British dispose of the goods they had lend-leased from the U.S. Regardless of where the property was originally distributed, all surplus naval lend-lease equipment now in the I-B and Malay - and that's some $10,000,000 worth - is offered for return to naval officials in this Theater. Once the British declare it surplus, a team of Navy experts flies down to the designated area for an inspection. Ships and floating equipment wanted by the U.S. Navy and found to be seaworthy or adaptable to economical transportation are either returned to the U.S. or to a U.S.-controlled port. The rest is referred to the Foreign Liquidation Commission for ultimate rejection or local disposal. The naval equipment offered for return varies from the "Walkie-Talkie" to the LST. There are radar devices, PT boats, ammunition, mounts for 22mm guns and even torpedo tubes - all used by the British during the war and now surplus to their needs. The whole job is handled by nine naval officers and two enlisted men. Of these, Lt. C. M. Peters, Lt. (j.g.) R. V. Kachinsky, Yeoman 1st cl. Dan W. Greene and Yeoman 3rd cl. Jimmy Lee all served on Carlson's sea staff aboard his flagship, the USS Harris (formerly the President Grant) during the Pacific war. At that time, the Commodore sailed with the Amphibious Forces, Pacific Fleet all the way from the Marianas to Okinawa and Japan. When peace came, his Transport Squadron No. 13 carried the 77th and Americal Divisions to the shores of Hokkaido and Honshu and were in the process of transporting a Seabee brigade to Tsingtao, China when the I-B assignment arrived. After the lend-lease property has been returned in India the sailors will really get nearer the water, for the next collection stations will progress from Columbo in Ceylon to Rangoon and, finally, Singapore. Last spring a Navy medical unit stationed in Calcutta under Cmdr. Julius M. Amberson, USN, started experimental techniques to prevent the cholera epidemic from reaching American personnel. By combining the use of blood plasma, sulfadiazine and a saline solution, they not only brought forth a preventative treatment, but a method of curing the dreaded disease. Whereas cholera used to mean 30 to 80 percent fatality, the I-B developed naval treatment now assures 100 percent recovery. While the Commodore's staff is here on a special mission and will "sail away" when that has been completed, there is another non-sea-going naval organization in the I-B that is permanent, "land-lubbed" being its everlasting curse. This consists of the various Naval Liaison offices scattered throughout the Theater, with headquarters also in New Delhi. Operating like a peace-time Naval Attach� group, these Navy men provide liaison between our Army and Navy and the Royal Navy and the Royal Indian Navy. One of the first war-time assignments of the Liaison office was caring for docking facilities of elements of the U.S. "Fighting" Navy which used India's ports in its battles against the Japanese. When Army troops started arriving early in 1942 the office took over the job of refueling and routing the naval transports. WILBUR By Menutis "Wilbur I'm Thinking of dropping you from the essential list." to feed and quarter them. Naval personnel were attached to British air depots for bomb details and other specialized work. But the Calcutta Fleet Post Office is not so busy these days, for the guard crews are down to three and the total number of Navy men in the Theater is now not over 80. Besides the New Delhi headquarters of the Senior U.S. Naval Liaison Officer, Cmdr. G. C. Miles, USNR, there are and were sub-offices all up and down the coast. In Bombay, liaison is maintained and a branch office handles the troop transport traffic for Karachi. In Columbo, Ceylon, an office operates liaison with the headquarters of the Commander-in-Chief, East Indies Fleet. Direction of troop transports is now in high gear at Calcutta and officials from the Liaison office represent the U.S. Navy in Rangoon, Batavia and Singapore. There used to be an office in Madras to take care of the merchant ships bringing supplies to Bangalore, but this is now closed. And when the pipeline to China shut down the Navy withdrew its Chittagong frontage on the Bay of Bengal. Navy men here discover no difficulty whatsoever in working at close-hand with the Army in India. They have found "the other half" cooperative and friendly and there have been no kicks over the Army food and quarters which they utilize. Naval service in the I-B counts as overseas duty, just as it does for the Army, and since most of the men are in the Reserve, they don't mind the shore assignment. But the one-star veteran of Pacific warfare and amphibious operation was more succinct. Said Commodore Carlson, when asked how he liked being out of water: "Terrible!" WASHINGTON - (UP) - Marine Corps Commandant Gen. A. A. Vandegrift said last week that U.S. Marines made no effort to shell the Chinese village of Tienchuang during their Dec. 4 search for the slayers of a fellow Marine. Vandegrift said in a letter to Eugene Meyer, publisher of The Washington Post, that the Marines were ordered to fire 25 rounds from 60mm mortars so they would fall short of the town. Only two window panes were broken and no one was hurt, he said. The letter was in answer to a critical editorial in the Post which was based on a new report that "American Marines fired 24 mortar shells into the village." The editorial, entitled Semper Fidelis - the Corps motto - asked "to what values are U.S. Marines faithful?" In these Signal Corps pictures taken on the docks at Calcutta, G.I. 's and native stevedores load a Liberty ship with old ammunition which later will be heaved into the sea far out in the Bay of Bengal. CALCUTTA - Three hundred miles out in the Bay of Bengal a heavily-laden Liberty ship slowly drifts to a stop. There is a sound of steam winches and out of the holds cargo booms lift strange objects that are gingerly placed on platforms built out over the sides of the ship. At a signal the platform dips and the objects cascade into the sea with a tremendous splash that throws as high as the ship's bridge. Old ammunition has just been given the "deep six" through the compliments of sea-going G.I. 's in the 1944th Ordnance Co. The dumping spot is 1,100 fathoms or 6,600 feet deep. Into these depths have gone land mines, hand grenades, mortar and artillery shells, small arms ammo, Chemical Warfare Service bombs and shells - plus regular aerial bombs ranging from 100 to 2,000 pounds. 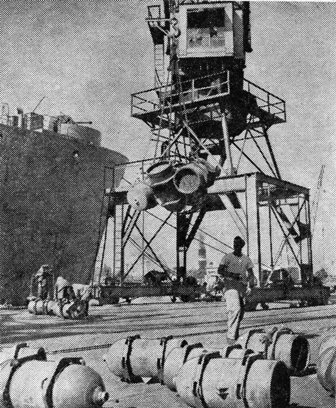 Disposal operations have been unmarked by fatalities either at the docks at Calcutta or over "the hole" at sea, but there have been occasional nervous movements, even despite the fact that there are no fuses in the bombs or shells. Take the time the S.S. Albert K. Smiley lugged out a cargo of bombs and ammo and began sliding 'em over. They sent a one-ton bomb on its way to the bottom and work resumed in one of the bomb-packed holds. Nobody knows just how much time passed when they suddenly became aware of an underwater "earthquake." The ship quivered and rolled. In the engine room the concussion smashed the electric light bulbs. On deck men stared at each other and in the hold with the bombs G.I. 's yelled up wanting to know "What the hell's going on?" Apparently, according to the disposal boys, the tremendous pressure of the water about a mile down - plus some fluke in the construction of the bomb - caused it to detonate close to the ocean's bottom. It never happened before and it hasn't happened since. Then there was the time, also aboard the Smiley, when the slight rolling of the vessel caused two big containers of mustard gas to sideswipe each other. The cap on one container was broken and the valve knocked open. Some of the mustard gas, actually a liquid, spilled out and into the hold before the valve could be shut off. There were no casualties then but six men were burned later by the stuff when they went down to clean out the hold. Mustard gas, incidentally, being heavier than water, sinks to the bottom of the sea. Generally speaking though, life for the ammo men is smooth and serene. It takes about seven days to load an ammo ship, one day to reach "The Hole," usually six days to dump the load, and another day to return to Calcutta. Originally about 80 to 90 G.I. 's shipped along to handle the unloading at sea, but this task has since been taken over largely by Indian laborers and the members of the merchant marine who work the ship. This naturally makes the G.I. 's pretty happy. Now the ships customarily put out with five enlisted men and an officer of the 1944th plus five enlisted men and an officer from the 508th or 497th Port battalions, and 100 collies. Since the project started last Nov. 1, the men have disposed of about 62,000 tons of explosives and gases of all descriptions. There now remains about 10,400 tons of explosives to be sunk and this is expected to be loaded by Feb. 26 for sinking. It is interesting to note most of the men in the 1944th and the two port battalions, the same units that won acclaim for their world loading records, are very young and comparatively new at the business. A typical ammo G.I. is Cpl. Clarence Tamoor, 21, of Dearborn, Mich., who's been in the Army three years. He was an Air Force mechanic in China, wound up at Camp Kanchrapara as a casual and was assigned to the 1944th. He's been supervising loading at the docks for a month, doesn't mind the work, and says, "All I have to do is supervise coolies." T/5 Thomas Wright, of Waseca, Minn., is only 20 years old. He was drafted two weeks after being graduated from high school, has been in the Army 20 months and overseas 14 months. He was in a QM outfit in China before being sent to the 1944th. "This is my first time fooling around with this stuff," he said. "Well, sure I was kind of worried the first couple of days. Why not? But you get used to this stuff pretty fast. I like the job now." Then there is T/5 Harold B. Dull, 23, of Soldiers Grove, Wis., who had been on the job at the piers four weeks. He said he was nervous around "all those explosives" the first day or two but now prefers the job, "All you do is push coolies," he grinned. Cpl. Ivan Scott, 25, of Terre Haute, Ind., is married and has one child, and was worried at first because his wife was worried about him, but she got used to it. "An Army job is an Army job," he philosophized. He's been at the job two months. 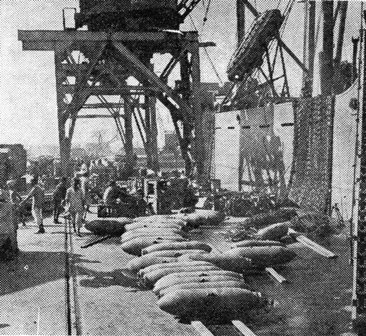 The men in the port battalions supervise and unload the ammo when it arrives at the piers in railroad cars and the men in the 1944th supervise its stowage on the ships. To date, the project has cleaned out the dumps at Chabua in Assam, the CWS dump at Ondal in West Bengal and the East Bengal dumps at Tezgaon, Kurmitola and Shamshernager. There remain only the dumps at Kanchrapara and Kharagpur. The four companies are destroying old ammunition at both dumps. ...the trains by men in the 49th Ordnance Battalion, whose 591st, 1904th and 60th Ammunition Companies operate at Kanchrapara while its 235th loads at Kharagpur. The airplane can have the air, the horse its bridle path and the automobile the traffic intersection, but the great open road is for Sgt. 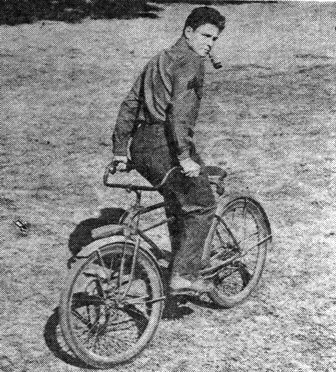 Bill Britch and his bike. And for a man that's done some 146,000 miles of cycling during the past 10 years, his claim is not to be sneezed at. Bill started peddling in his hometown of Pittsburgh, Pa., at the age of 11 and has left the "saddle" very seldom since then, one of the times being to get married. Once he wanted to see how far he could go in 24 hours, so Bill went from Pittsburgh to Erie, Niagara Falls, across the river to Canada and back over the international border to Rochester, N.Y. - a distance of 302 miles in 23 hours 45 minutes! He made only one stop: to ride the "Cyclone" at Crystal Beach Park in Ontario Province. He even ate on the bike, reaching behind to the food basket for a coke bottle and prying off the cap on the whirling spokes of the front wheel - all while still peddling. The Britch family bicycle is in nudging-out distance for one of the seven wonders of the world. Of course it has a siren, a lunch basket and a speedometer, but that's just ordinary. It also limps along under a sheepskin-covered seat, a cycle-meter, a generator, a tail light that blinks with the brakes (it's in the plural: there's a front and rear one) six headlights popping out from fenders and handle bars and a seven-cell flashlight which Bill beams at obstinate cars whose drivers forget to use the dimmer. Bill doesn't care much for G.I. bikes, "They're badly balanced." At home he used to put lead weights on his handle bars, give the thing a push, and if it scooted off without rounding a curve, well ok. But that doesn't mean he's above getting on a G.I. bike over here, raising up the front wheel and riding backwards on the rear one. Matter of fact, he's done just that, both in Calcutta and in New Delhi, where he's now a draftsman with the Engineer Section of Army headquarters. Strange as it may seem, Bill has never entered a "Sid-day Bicycle Marathon." He has long wanted to, but on the first occasion he came down with appendicitis and on the next with a broken collar bone. But the collarbone is mended, Bill will soon be on the shipping eligibility list and then it's home, the wife, the baby bout to be born - and a radio for the family bicycle. WASHINGTON - (UP) - The House Naval Affairs committee has approved a bill authorizing President Truman to transfer surplus battleships, carriers and other combat vessels to China, provided he receives prior consent from Congress. PANAGARH - Instructions have been received to salvage 129 "war-weary" aircraft now at the AAF's Eastern Air Depot here. This brings the total of such transport planes salvaged recently to 229. The planes scheduled to be salvaged are 126 C-46 Curtiss Commandos, two UC-61 Fairchild Argus ships and one C-60 Lockheed Lodestar transport. In face of the non-existent requirements for aircraft which cannot be repaired economically, the Officer of the Foreign Liquidations Commissioner has recommended these ships be salvaged. According to a communication from the FLC, although military and commercial markets have been surveyed for particular needs of this type of plane, "there appears to be an inadequate market in India and elsewhere for even a number of C-46's in good condition." G.I. 's and officers throughout the Theater will have a chance to buy articles of surplus property under an arrangement just concluded among the Army Exchange Service, G-4, and the Foreign Liquidation Commissioner. This is to implement Theater Circular No. 27, dated Jan. 30. Here's the plan: If you want any kind of U.S. Army equipment to take home, write a letter to the Chief, Army Exchange Service, Hqs., USF, IBT, APO 885. List items that you want in complete detail, with full Army designation and identification. Specify at which PX you will take possession of these items. And mail your request before March 1. It is emphasized that everyone will not get everything he wants by any means. But the Theater Exchange Officer will supply to FLC by March 1 a consolidated list of all requests received by him up to that time. G-4 will attempt to locate, claim and furnish to FLC all articles requested. FLC will then sell such requested articles as have been declared to it to the Theater Exchange Officer. The articles will be distributed to the various PXs for resale to the individuals having made requests for them. Delivery will be made at whatever PX is specified by the soldier requesting them just as quick as possible after March 1. Theater officials point out that it is advisable that requests be limited to smaller articles, because a soldier will have to get home whatever he buys himself. And it must be understood that no article can be re-sold by a soldier to anyone else. The whole idea is to give U.S. soldiers a break and try and sell them articles that will be useful to them at a reasonable price. So, hurry! If there is something that you've wanted all along, send in your request right away. Maybe it's a wrist watch, a camera, parachute silk or even a fishing kit. Whatever it is, ask for it. But use discretion since those articles which are available will only be in limited supply and the goal is to make an even distribution of the articles throughout the Theater.